talklesssaymor August 7, 2011 August 7, 2011 Comments Off on Fitness Friday…a day late! Yesterday ended up being super crazy busy! I helped my sister get a new cell phone/put her on my account (and dealt with all of the blood pressure raising situations that followed), followed by a little shopping trip. After a quick lunch, I went to say goodbye to Tracey as she leaves for Spain at the end of the month and this is the last time I’ll see her. Then we went to visit my Grandpa at his new apartment and a couple other quick stops. Upon returning home, we were ready to tackle packing the car as my parents were moving my sister to Baltimore today (after dropping me off at the airport) for grad school. We quickly learned the car would not hold all of her stuff and asked to borrow my great uncle’s Suburban. This is usually a good solution though the battery was dead. Several attempts at jumping the battery and a call to AAA later, we had the suburban packed and ready to go. I should inform you the battery was dead again by the time we were done packing but thanks to some “trickle charger” (?) working while we slept, we were on the road bright and early at 6am! I have arrived back in LA, taken my Anatomy midterm, took an amazing yoga class, went grocery shopping and made a delicious pizza that I happened to eat more than I should have. Now I sit here, finally filling you in on a week of fitness and keeping it short so I can take a Benadryl and head to bed. I’m aware it’s early but I work in the morning, am totally exhausted and my mosquito bites have started to itch like crazy again! And please think about my family as they’ve run into more car trouble today, I would like them to have a safe trip and return home! 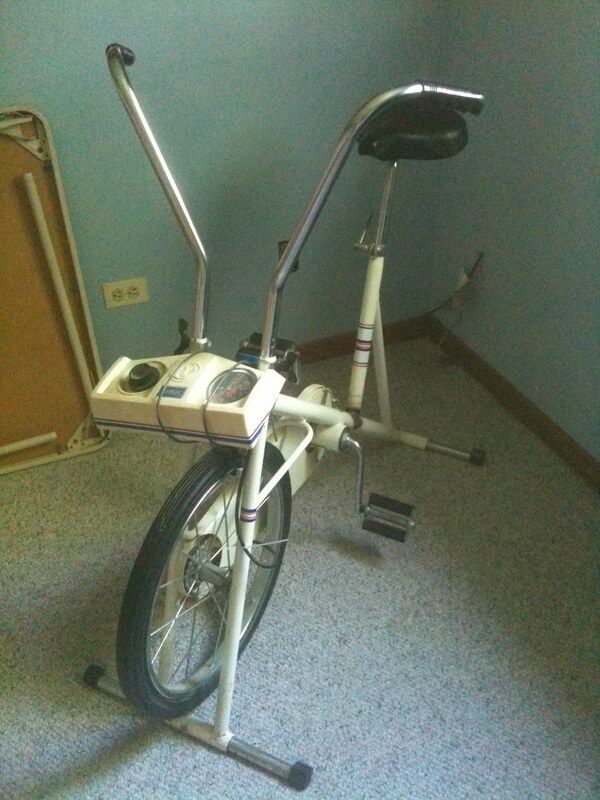 My parents moved their super old stationary bike from the basement into the den and when I saw it I decided it was the perfect way for me to get some exercise this week, without killing my lungs in the midwest heat + humidity. So I grabbed the first Harry Potter book (I’m starting from the beginning because I never made it past the first book and second movie) and spent my week biking + reading. I loved it! It was such a fun way to spend my time and made reading without getting bored/tired easier too! Win, win! Oldest working stationary bike ever – and it’s LOUD!